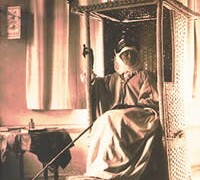 Lady Anne Blunt lived most of her life in the shadow of her awful husband Wilfrid, an adulterous cad who pranced about spending her money willy-nilly. 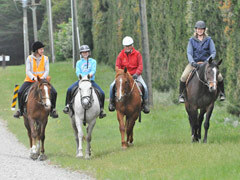 Kimberley and Lyn have done three rides this season, all with the local Mt Linton club. 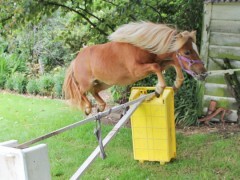 There’s not a lot of Crabbet blood in this one, but she sure can jump! Duchess is pictured here clearing 80cm under the sycamore tree in the garden. 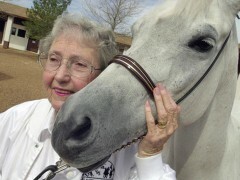 Renowned US Crabbet arabian breeder Bazy Tankersley died on February 5 at the age of 91 in Tucson, Arizona. 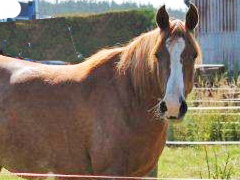 Pure Crabbet four-year-old Aurora Reniah (Silver Omen x Fenwick Regenta) is home from finishing school. 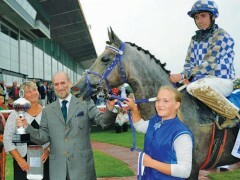 Owner and author Dr Mohammad Bin Abdulaziz Al-Nujaifi has been ranked as the world’s top Arabian racehorse owner for 2012 according to IFAHR statistics. The 2013 Catlins Canter is approaching. 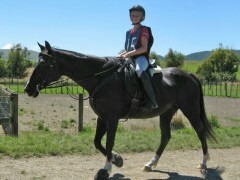 Last year we had a great time there, with Joanne riding Mertz (Woodlau’s Merlin) and Lyn riding Feeks (Aurora Rafeeq). 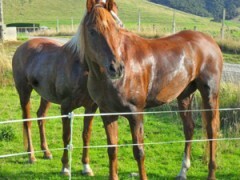 The girls had a fun few days out riding “Aurora” horses in Canterbury recently.